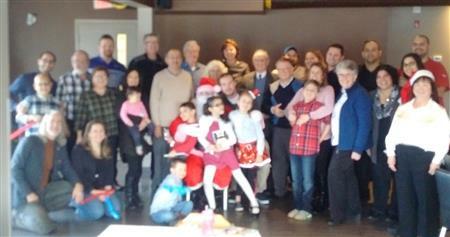 Rotary Club of Ottawa South members and family gathered at KS on the Keys for a Christmas brunch. 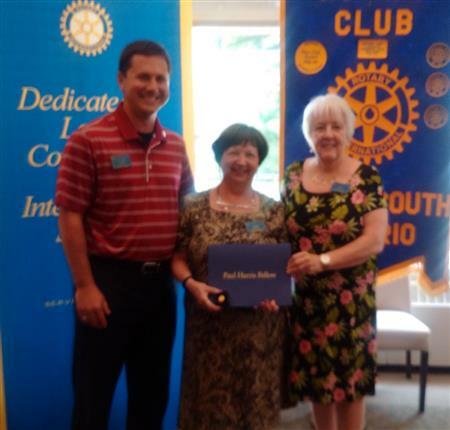 At our meeting on July 20 2016, Joan Hunter was deservedly awarded presented with the Paul Harris award. We were graced with intelligence and youth — the recipients of our High School bursaries joined us today. 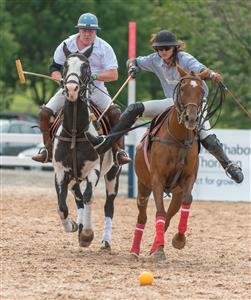 The Rotary Club of Ottawa South has partnered with Wesley Clover Parks and the Ottawa Polo Club to bring Ottawa the inaugural Polo in the Park fundraising event to benefit the Wabano Centre for Aboriginal Health and TROtt (Therapeutic Riding Association of Ottawa-Carleton). Ringing Santa's Bells for Charity! 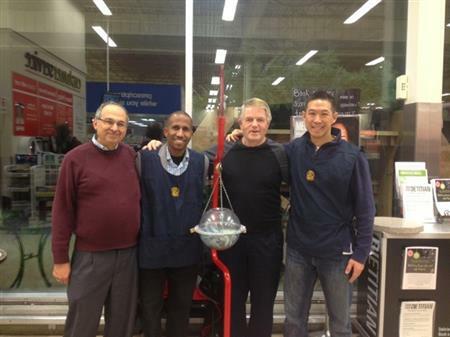 Rotary Club of Ottawa South members helped the Salvation Army with their annual Christmas Kettle campaign. 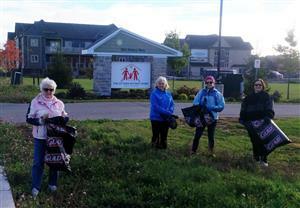 Cleaning up the capital, along bank Street by Rotary Way and the Ottawa Rotary Home. A fun Rotary evening sampling decadence. 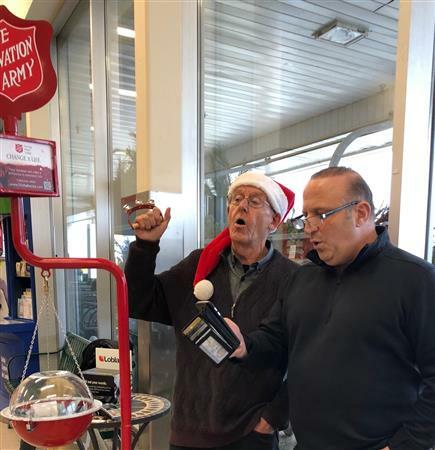 Several members of Rotary Club of Ottawa South volunteered their time for the Salvation Army Christmas Kettle at Billings Bridge. Even Santa showed his Rotarian spirit! While in Cornwall for the District Assembly on April 20th, some RCOS members checked out the Quilt of Belonging. Do You Have a Prom Dress to Donate? Dresses and acccessories can be dropped off at any Browns Cleaners location. Launch of Rotarians for Wabano! 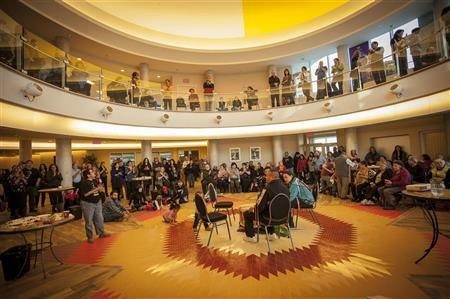 On March 20, 2013, Rotary representatives attended the soft opening of Wabano Centre for Aboriginal Health and announced the launch of Rotarians for Wabano campaign. 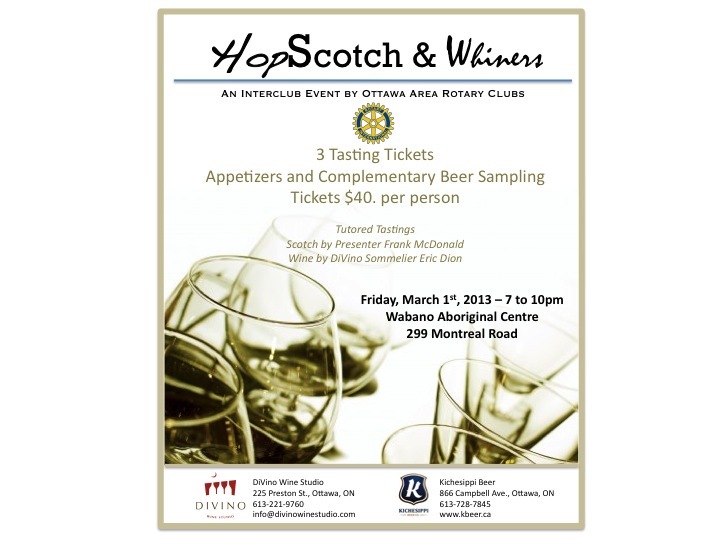 Ottawa area Rotary Clubs present a scotch and wine tasting with Kichisippi beer on the side! Scotch presented by Frank MacDonald, wine presented by Sommelier Giovanni Doe. New Year's Eve on Sparks Street! Rotary is helping to sponsor the best party this New Year's Eve! Celebrate the Canadian way, just a block from Parliament Hill at a super outdoor block party. Sparks Street will be alive with a DJ and many live bands - including the Arkells! Beer and food booths, CTV television and several thousand of your best friends. And it's FREE! 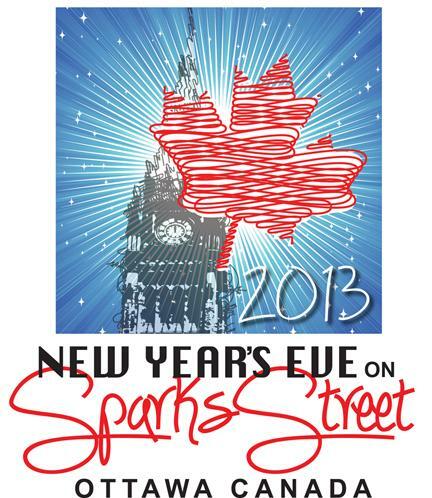 Get a gang together and party in the New Year on Sparks Street! The 2012 recipients of the Ledbury Banff Community Scholarship Program have been announced! Change Over Night on June 27, 2012 was a wonderful evening of reflection, celebration and optimism! Karen Simpson from Landscape Depot, RCOS President Vaughn MicKinney and Glebe Centre Manager Lawrence Grant cut the ribbon to officially open the newly landscaped sitting area in front of the Glebe Centre. 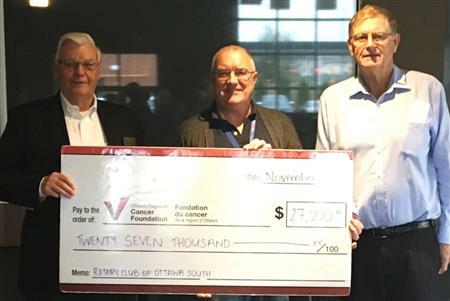 Rotary Club of Ottawa South held its lunch meeting Wednesday May 2 at the Ottawa Regional Cancer Foundaton's Cancer Survivorship Centre. A Little Irish In Everyone... Some More Than Others! Rotary Club of Ottawa South enjoyed a St. Patrick's Day dinner at KS on the Keys Friday night. Most everyone was able to attend and everyone's spouse was happy to come along as well. We were fortunate to have some awesome talent to provide authentic music for the celebration. Thanks to new member Peter White we were entertained by the guitars and voices of Arabelle, son Sean and Bo Fougere from Big Pond, Cape Breton. And our own Alex Davidson played a mean harmonica! Click here to check out the photos. We're thrilled to welcome Peter White and Eddie Chu as recent members. 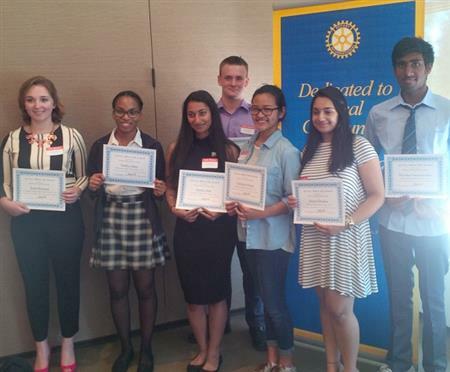 They are wonderful additions to Rotary Club of Ottawa South! 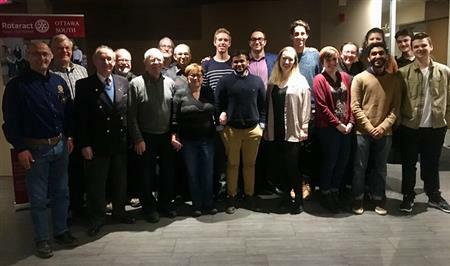 On Tuesday, February 7, 2012 at the KS on the Keys Restaurant, Sarah Ingimundson, President of Rotaract Ottawa South presented a $2000 cheque to Katherine Carter of the Distress Centre of Ottawa and Region. RCOS Adds Slurpies to Ice! The sticks were slappin’ and the slurpies were slurpin’ January 13 - 15 at the Leitrim Arena. 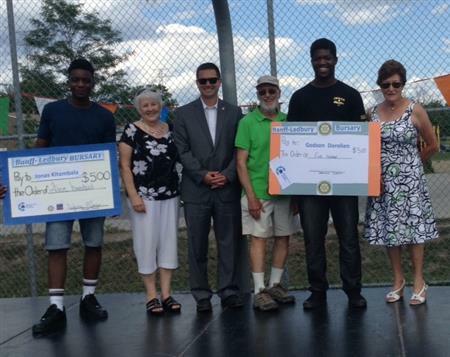 The Rotary Club of Ottawa South (RCOS) is providing a cash donation, some sweat equity, and facilitating in-kind donations from local companies to assist the Glebe Centre with their front entrance upgrade. On Saturday morning (Oct 1) RCOS members were digging, hauling, dumping, piling, planting, stomping, watering, and having a great time working together in the spirit of friendship and goodwill. RCOS also rallied some neighbourhood support and saved the Glebe Centre many thousands of dollars. The Glebe Centre is a charitable not-for-profit long-term care home that provides long term care; specialized care and community services to clients in the Ottawa community. The Glebe Centre is dedicated to developing and delivering services that support the highest quality of life for the clients we serve by living our values every day. Round-up for Literacy 2011 THANK YOU! Thank you to all who bought tickets and silent auction items for your support, hope that you had a great time and look forward to seeing you at Round-up for Literacy 2012 (perhaps in warm August!). And shaving my head raised a good chunk of money, so we’ll need to find a victim/volunteer for next year! 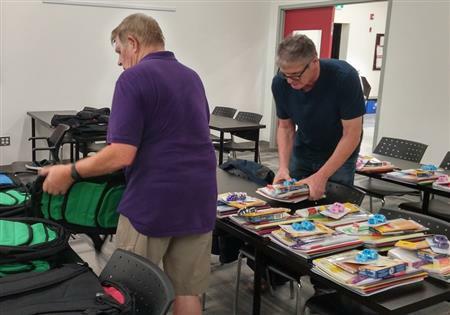 All proceeds from the event assist several local literacy projects and high school bursaries supported by the Rotary Club of Ottawa South. Dawn of a New Day for RCOS! 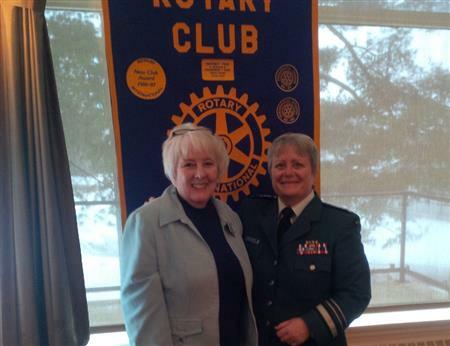 Rotary Club of Ottawa South welcomes Dawn Cooper as our newest member. The Rotary Club Ottawa South held a BBQ on Saturday, June 25, 2011 to celebrate the 25th anniversary of ROTEL. Despite the clouds and intermittent showers, over 60 invitees attended the event, including Mayor Jim Watson. At our luncheon on June 15, 2011 we had the honour of meeting and listening to several local high school students who have distinguished themselves during their secondary school years. 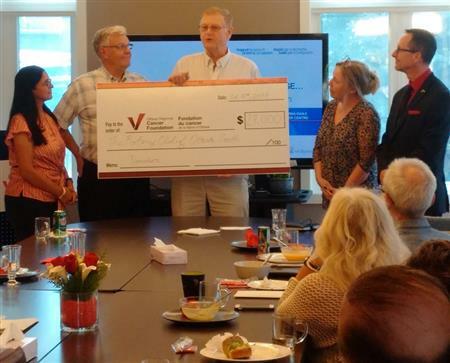 The RCOS offers a bursary to three local High Schools (Hillcrest HS, Ridgemont HS and Brookfield HS) as well as the Ledbury Banff Community Scholarship Program. See photos. This year we supported Cancer Canada's Relay for Life. It was our first year and more of a reconnaissance to scope things out for next year. We had fun, raised over $3,200 to fight cancer, and now we know what to plan for next year (Terry is in charge of designing matching uniforms!) Thank you to RCOS members Marci Perreault (and her coworker Amy - who actually raisied the most money! ), Orrie Rooke, Adel Harami, Terry Roman (and wonderful wife Tracy), Allan Cayer, Vaughn McKinney, Scott Vetter and friends of RCOS Boaz and Tania). Follow this link to see the RCOS Relay gang and some fo the sights tha Friday evening. 2011 Golf Tournamant A Great Success! Thanks to Bernie Ingimundson and his committee for (again) organizing a fantastic golf tournament on June 6, 2010. The weather was beautiful and of course so was the Hunt & Golf Club course. Everyone had a great time; and thanks to the auction, draws and sponsorship efforts, over $50,000 was raised for local charitable causes. Check out the photos! Follow the links below to learn more about how you can help. Follow the links below for more information as to how you can help. St. John Ambulance has no budget in place for this critical mission. The RCOS was chartered in June 1967 specifically to serve the needs of the swiftly growing community in the southern part of the National Capital Region. 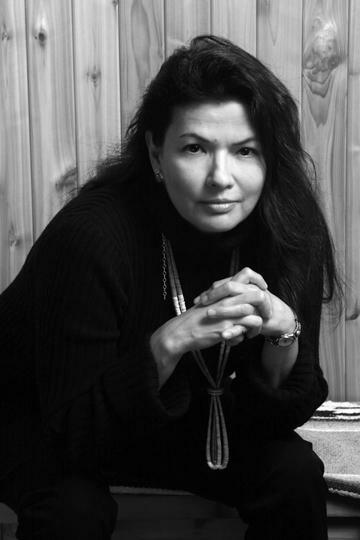 Ledbury Banff Community Scholarship Program is an exceptional program founded and directed by Michael Small. 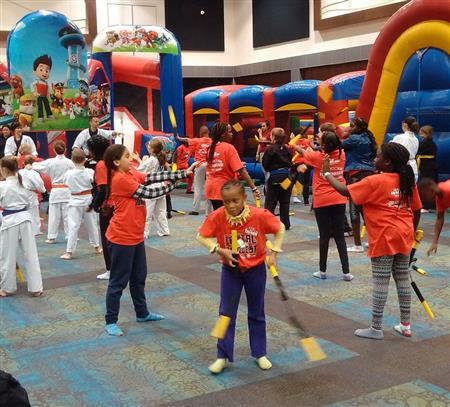 RCOS raised money at our annual Round-up for Literacy event and contributed two $500 scholarships. Committee Chair Maria Saracino and Club President Terry Roman presented the cheque. RCOS members gathered for lunch at the Banff Avenue Community House to learn about this community project that RCOS supports. Major Mark Wuennenberg was our guest speaker on September 22, 2010. He gave a very interesting and engaging talk on the use of Un-manned Aerial Vehicles, particularly in Afghanistan. Kim Sheldrick, Manager of the Hospice at May Court provided an informative and interesting presentation. She provided a wonderful overview of their activites, initiatives and goals. Dr. John Sinclair and ORCF President Linda Eagan bring us up to date on Ottawa's CyberKnife and teh Cancer Surviorship Centre. Rotarian, and WaterCan Executive Director, Gary Pluim cuts the ribbon to open a new water station and library. 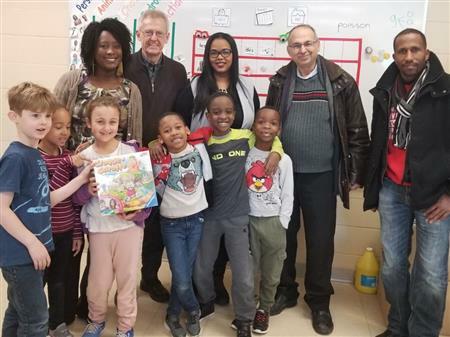 Rotary Club Ottawa South combines literacy and water in Ethiopia. CLub President Terry Roman presents cheque to fellow Rotarian Captain Thomas Yoo. RCOS member Adel Harami visited Rotary Clubs on a visit back to his homeland.